All happening on July 11, 2009 ! No secrect ! The Historical and Magic of Xiamen will be in your hand , face to face ! Xiamen Wave's dicision to this action was long long time ago, and I guarantee this is just a start . Felt like Hamilton Island , Xiamen probably will make a lucky 'Ben Southall' here for the best job in the world , in a different space , a different culcure , a different people. ‘FIND IT’ is a community based art event and everyone is invited to take part. The labyrinth of corridors, alleyways and walks between Xiahe Lu and Zhongshan Lu, Lujiang Dao and Siming Beilu reveal an area rich with the sights scents and sounds of Xiamen’s past, a reminder of the way things once were and indeed still are, for a few remaining local stalwarts. The area around the Wave Arthouse used to be important for banking and gold trading after Zhongshan Lu was developed as a commercial zone in 1928. Recently the film ‘Crazy Racer’ was shot in Zhenbang Lu—the corner house featured on the map appears in the film. Take time to examine some of the local buildings, particularly the second storey upwards, and you will gain valuable clues about past usage. During your walk you will encounter the excitement of local street markets, stallholders selling all manner of foods including fruits, local delicacies, clothing and brick-a-brac, as well as fresh fish and meat. Please bear in mind that this is an authentic experience, life as it is lived by ordinary everyday people. Try some of the local produce. Maps and question sheets can be picked up at the Wave Arthouse and are free from 4:00pm on Saturday July 11th at the official opening. 2nd Prize A Book of photographs by the renowned Shanghai photographer, Maleonn. Maleonn’s work has been shown all over the world and his international reputation is rapidly growing. 3rd Prize A hand crafted Thai Shadow Puppet print used to represent both the mystical and historical values of the Thai culture. 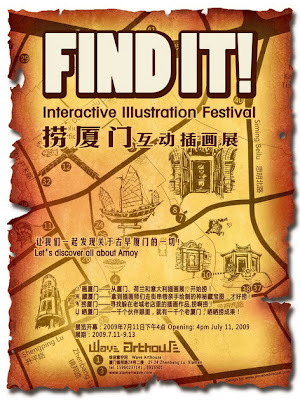 Participants are asked to submit articles/illustrations/photos/artwork of the Find it! Challenge Walk and the sights of the old Xiamen area by July 24. For instance you might wish to write about the area, take photographs of people, places or make drawings/illustrations- it’s up to you. There will be two prizes. Each will receive a Deluxe Room for a one night stay in the Millennium Harbourview Hotel Xiamen for two people, including breakfast in the Coffee Shop, 2 Cocktails in Hollywood Bar and 2 soft drinks in Golf Bar. Start at the Liu Jien Hotel [opposite the Gulangyu Ferry] and walk up Zhonghshan Lu, past KFC. Turn left at the next junction into Zhenbang. About 100 meters on the right is No 24, next to a wedding photography business. The Wave Arthouse is on the second floor. Here where you can pick up your FREE map, competition details and a guide to local history.